This article is about the encyclopedia. For the 2000 rock album, see Geographica (album). For the French-language magazine, see Géographica. 4–40 Critique of Homer's and the other poets' geography and various writers' view of it, especially Eratosthenes'. I.3 1–2 Critiques of Eratosthenes' sources: Damastes, Euhemerus. 3 Critiques of Eratosthenes' geology, shape of the Earth. 4–7 Fossils, formation of the seas. 13–15 More on the formation of the seas. I.4 1 Heaven is spherical corresponding to Earth's sphericity. 2–6 Distances along lines of latitude and longitude to various peoples and places. 7–8 The three continents: Europe, Asia, Libya. 9 Recommends Alexander the Great's division of people into good or bad rather than the traditional Greek barbarians and Greeks. Pages C67 through C136, Loeb Volume I pages 252–521. II.1 1–3 Relates Eratosthenes' description of the Tropic of Cancer, which was based on Patrocles. 4–5 Critiques Hipparchus' criticism of Patrocles, which was based on Deimachus and Megasthenes. Points out that Eratosthenes used the Library of Alexandria. 9 Fabrications of the geographers concerning India. 10–41 Calculations of distances between parallels and meridians passing through various places in the habitable world, according to various geographers: Hipparchus, Eratosthenes, Pytheas, Deimachus. II.2 1 Introduces the work Oceans by Poseidonius. 2–3 Critiques Poseidonius, who criticises Parmenides and Aristotle on the widths and locations of the five zones. II.3 1–3 Critiques the six zones of Polybius. 4 Describes African voyages: the circumnavigation by an expedition sent by Necho II, another by Magus; to India by Eudoxus of Cyzicus. 5 Adventures and misadventures of Eudoxus. Attacks the credibility of Pytheas, Euhemerus, Antiphanes. 6 Poseidonius' theory of Atlantis; attributes migration of Cimbri to inundation. 7 Attributes the distribution of plants, animals and civilizations to chance (suntuchia) rather than to zones (which was Poseidonius' theory). 8 Example of random racial distribution: Ethiopians were in both Asia (India) and Libya (Africa). Strabo says his school avoids such causal connections. II.4 1–2 Polybius' critique of Pytheas. 3 Strabo's criticisms of Polybius' European distances. 4 Strabo's criticisms of Polybius' critique of the distances of Eratosthenes. 5–6 Strabo's corrections to various geographers' descriptions of the locations of the Tanaïs, the Tyras, the Borysthenes and the Hypanis. 7 Strabo criticises Polybius' length of the inhabited world. 8 Strabo criticises Polybius' and Eratosthenes' physical divisions of Europe. II.5 1 Representation of a spherical surface as a plane requires the geographer to be a mathematician. 2 The celestial sphere, gravity, the Earth's axis and the poles, stellar paths, equator, tropics, arctic circles, ecliptic, zodiac. 3 The five zones, terrestrial and celestial, the hemispheres, the ocean. 4 The gnomon, latitude, longitude, circumference of the Earth. 5–6 The inhabited world is an island shaped like a truncated cone, in a spherical quadrilateral formed between the equator, the arctic circle and a great circle passing through the poles. The island is 70,000 stadia long by 30,000 stadia wide. 7 Hipparchus says the equator is 252,000 stadia long; the great circle distance from equator to pole is 63,000 stadia. 8 Strabo does not believe Pytheas that Thule is farthest north at the Arctic Circle. He thinks no one is north of Ierne. He believes the Romans scorned to invade Britain as being worthless. 9 The length and width of the inhabited world are 70000 and 30000 stadia respectively. 10 Strabo recommends representing the Earth on a globe of no less than 10 feet in diameter or on a plane map of at least 7 feet. 11–12 Strabo says he personally travelled from Armenia to Tyrrhenia and from the Euxine Sea to the frontiers of Ethiopia. He and all other geographers receive information mostly by hearsay. He went up the Nile river with his friend Aelius Gallus, prefect of Egypt, to the edge of Ethiopia and Syene. 13–16 The known limits of the Earth are Meroe in the Nile river, Ierne, the Sacred Promontory beyond the Pillars of Hercules and east of Bactriana. 17–18 The sea determines the contours of the land. The four largest internal seas are the Caspian sea, the Persian Gulf, the Red Sea and the Mediterranean Sea. 26 The continents are Europe, Libya, Asia. Europe develops excellence in men and government and has contributed the most to the others. 27–33 States the locations of the countries of the three continents. 34 Division of the circumference of the Earth, which is 252000 stadia, by 360 gives 700 stadia per section. 35–43 Equator, Tropic circle, Arctic circle, latitude by the shadow of the gnomon and the length of the longest day. III.1 1–3 Ibēria is poor, inhospitable and mountainous, 6000 stadia N–S, 5000 E–W. The Purēnē oros is aligned N–S and separates Ibēria from Keltikē. 4 The Sacred Cape is the westernmost point of the inhabited world. The country next to it is called Cuneus, "wedge", in the Latin language from its shape. It is occupied by the Ibēres across the straits from the Maurousioi. 5 Strabo repeats Poseidonius' assertion that the setting sun is larger at the coast because of a lens effect through the water vapor. He says Artemidorus is wrong in claiming a size of 100 times larger and that he could not have seen it because the cape was taboo at night. 6 South West Iberia is delimited by the Tagus river (to the north of the Sacred Cape) and the Anas river to the east. The region is populated by the Keltikoi and some Lusitanai resettled there from beyond the Tagus by the Romans. Inland are the Karpētanoi (Madrid region), the Ōrētanoi (La Mancha and eastern Sierra Morena, and the Ouettōnoi (Salamanca region). The fertile southeast, Baetica (Andalusia region), east of the Baetis river after which it is named, is occupied by the Tourdētanoi or Tourdouloi, who have writing and a literature. Other Iberians have alphabets, but not the same, as they do not all use the same languages (glōttai). III.2 1–2 Bætica is the region around the Bætis river, main cities are Corduba and Gadira. 3–5 Bætis river is navigable and boats go from the sea to Corduba. 6 Bætica soil is fertile, it exports a lot of wheat, wine, and oil. 7 Bætica littoral is full of fish, especially fat tuna, which eat a lot of acorns like some "sea pigs". 8 Bætica subsoil is full of gold, silver, cooper, and iron. 9–10 How gold and silver are extracted from the soil of Baetica and other regions of Hispania. 11–13 What Homer says about Bætica. 14–15 Bætica was a Phœnician colony, now it's romanised. VII 1 Overview of the lands to be covered in the rest of the text. 3 Geography of Germania, list of Germanic tribes. 4 Roman conflicts with Germans. 5 The Hercynian Forest, the Ister river. VII 1 Correcting false tales of the Cimbri. 4 Lack of knowledge of areas beyond Germany. VII 1 Southern Germania, myths about distant regions. 3 Mysian culture and religion. 4 Getae. Different views of their culture. 5 Zalmoxis, his travels, and his influence on the Mysians. 6 Errors in other Greek accounts of Mysia. 13–19 Danube river, Dacians, Thracians, Peucini, Dniester river, Dnepr river, Roxolani. VII 1–12 Countries along the west bank of the Danube. VII 1–2 Continuation of countries along the western and southern banks of the Danube (the Balkans). VII 1–2 Continuation on the Balkans. 17 1–2 Eratosthenes on the Nile and surrounding people. 3 The Nile in Ethiopia. The organization of Egypt, nomes, classes, comments on the Labyrinth. 4 The Nile in the Nile Delta. 5 Source of the Nile. Greek writers about the Nile. Definition of the name Aegypt. 6 Harbours of Alexandria, Pharos Island. Julius Caesar. Founding of the city by Alexander the Great. 7 Importance of Alexandria. Lake Mareotis. 8 Details about Alexandria. Ptolemy I Soter steals Alexanders body. Perdiccas is slain. Roxana departes for Macedonia. 9 Lighthouse of Alexandria. Other temples and buildings, Lochias (promontory), Royal palace, Antirrhodos (island), Theatre, Poseidium, Emporium, Timonium, Caesarium, Heptastadium. 10 More details about Alexandria. More buildings and structures. The Sarapium. Emperor Augustus defeats Mark Antony. 12–13 Egypt as a Roman province. Roman Legions. Polybius' visit to Alexandria. 14 Coastal cities from Cyrenaica to Alexandria. About wine. 15 Papyrus, Cyperus and Cyperus papyrus in the Deltaic marshes and lakes. 16–17 Road to Canopus. Temple of Sarapis. 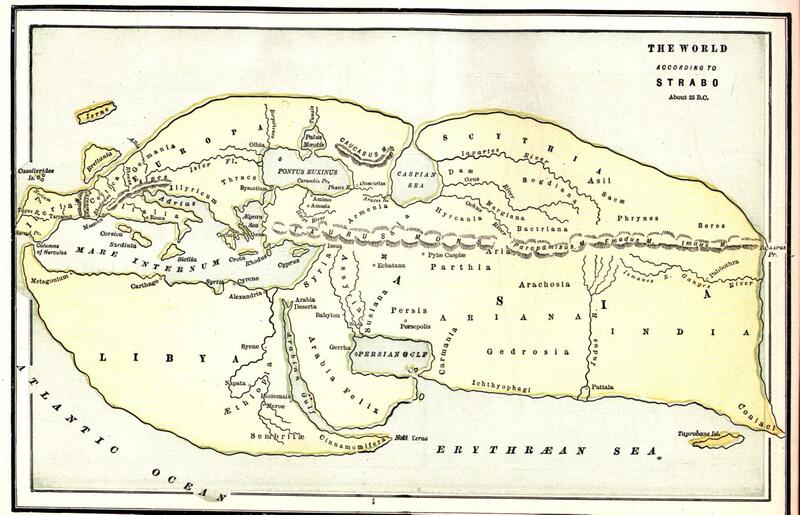 18 Nile mounts in the Delta, Canopic (Canopus), Bolbitine (Rosetta), Sebennytic (Buto), Phantnitic (Damietta), Mendesian (Mendes), Tanitic (Tanis) and Pelusiac (Pelusium).